Call +9205802128 or 9205802127 for best price quotes! 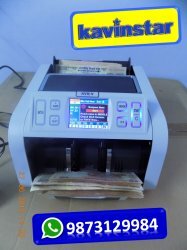 •Latest model in loose note counting machine. •It features in robust silver design with LCD screen and touch screen buttons. •It has counting speed of 1000 notes per min. •Detects fake note and pre 2005 notes with its advanced detection system which uses UV and 2 Levels of MG sensors. •When the machine suspects a note the LCD turns red along with an alarm. •It also has Add and Batch Function. •It is fully automatic with auto on/off, integrated fake detection and self examination. •Also the in built dust extraction system increases the life the machine and reduces the regular maintenance. •Light weight and compact, the handle make it is very easy to carry around.